When is the best time to wash clothes? Your washing machine will use the same amount of energy regardless of what time you run it. However, depending on your energy provider’s rates, you can often save on your energy bill by washing your clothes at different times of the day. Try washing before 4 p.m. or after 7 p.m. – Many energy companies charge extra for electricity during their “peak hours,” which see increased energy usage. During the summer, run your washer early in the morning – energy use peaks on hot afternoons. 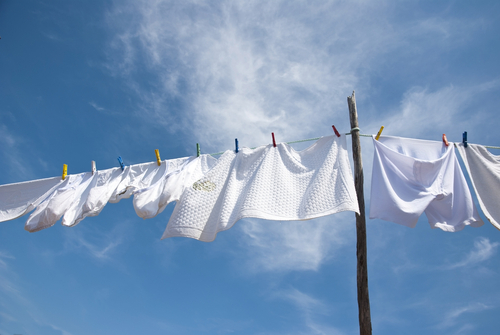 Winter weather drives demand for electricity earlier in the morning, so wash your clothes late at night. Before you grab the detergent, visit your energy provider’s website to get exact rates for this month’s on-peak and off-peak times. How do you save money when doing the laundry? Cold water wash – According to EPA affiliate Energy Star, your washer uses about 90 percent of its energy heating up water. Switching your temperature settings from hot to warm can cut energy consumption in half – and shifting from warm to cold can save even more. Line dry – Opting to air-dry your clothes spares your energy bill an extra dry cycle and adds to your favorite T-shirt’s shelf life. Wash bigger loads – Your washing machine will use the same amount of mechanical energy whether you select “small” or “super.” Take advantage of the electricity you’re already using by washing larger loads. Clean the dryer’s lint trap – When you use your dryer, be sure to remove the leftover lint after each cycle. This improve air circulation and allows your dryer to work faster, wasting less electricity. Dry on moisture sensor mode – Instead of setting your dryer for an exact amount of time, try the moisture sensor mode, which automatically ends the cycle as soon as the clothes are dry. It saves time and can reduce your bill.